Over 80 years ago, cyclopean aviator Wiley Post brought fame and glory to Dust Bowl ravaged Oklahoma by being the first person to fly solo around the world. After all of that toil on the ground and all of that turbulence in the skies just to make that historic flight, I kind of wonder how he’d feel if he knew his life’s work cumulated in being honored by a French toast dish that clumsily bears his pun-strewn name. 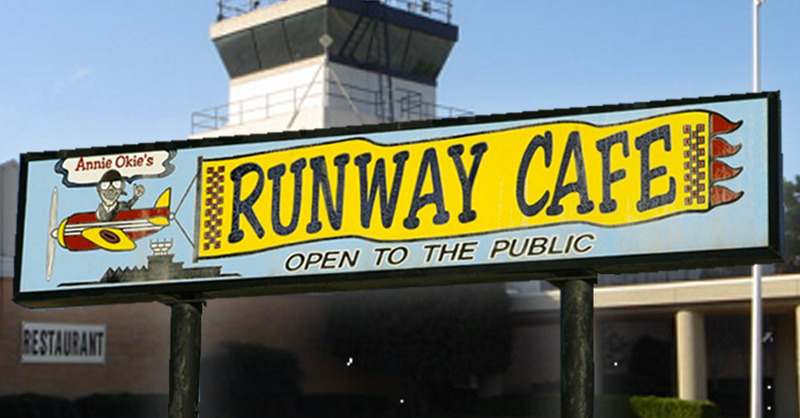 I’m talking about Annie Okie’s Runway Café, of course, located in the sparse Wiley Post Airport at 5915 Phillip J. Rhodes Ave. in Bethany. Mostly identifiable by the word “RESTAURANT” in block letters on the outside of the terminal, inside Annie Okie’s is actually a surprising barrel-roll of aviation fandom as breakfast foods face the desolate runway while patrons with child-like glee hope that one—just one measly plane—will take off in front of them to make this early morning excursion doubly worth it. The menu itself is filled with clever-ish names that are based on and around the aeronautical field, from the eponymous Annie Okie Omelet with ham, mushrooms and mozzarella to the blazing B-2 Bomber featuring two eggs, bacon or sausage, hash brown and toast and jelly, all of which are marvelous choices for morning meals that most people, I’m sure, would devour at Mach speed. As for myself, however, I haven’t really sat down to a proper breakfast lately, at least not since my rehab days. But, coming in hot with an empty fuselage, I decided to fill-up with what I hoped to be a delicious take on the aforementioned legendary airman’s lasting namesake; with effortlessly prompt service, the Wiley Toast ($5.69) came in for a landing at my table with a hearty helping of a fresh biscuit and gravy ($2.99) beautifully guiding them in. Starting off, as anyone really should with most every breakfast, the biscuit and gravy were a top gun starter, earning high marks with a flaky tuft of well-baked bread that came apart in tasty layers, which I dutifully covered in a thick drenching of that peppery white cream delight. I thoroughly mopped the deck with that biscuit to nourishing effect, leaving little-to-no gravy on my plate or the table, Roger that. And while that was a self-contained black-box of a breakfast appetizer, the real block of crew-duty at Annie’s comes from the wildly surprising Wiley Toast: four points of golden pan-fired toast, bathed in powdered sugar like they just came in on the first flight from Medellin, with a slight dollop of Churn Spread across the tops with a bogey of warm syrup right on my tail. It was obvious the Wiley Toast was at the top of its class at Annie Okie’s. The addition of two spicy sausage patties and a nice-sized scoop of scrambled eggs was a highly unnecessary but fully welcomed treat that’ll gives anyone’s hunger a big mayday, defiantly proving that not all airport eats have to be overpriced fast-food. 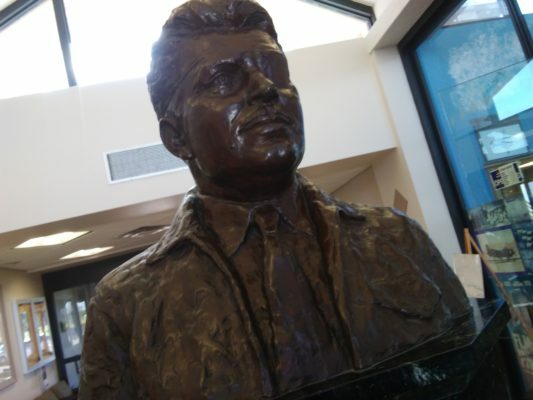 As I scooped up the last bit of egg into my toast, I looked over at the inspirational bust of Wiley Post in the lobby and, giving a one-eyed wink, realized he’d be damn proud this French toast carries on his Okie namesake here. Cómpralo ya! Next post Remember when Ralph Shortey talked about masturbation on The Daily Show? Great review. I will put this on my list of places to visit soon. Thanks. Glad you are back and eatin for us again !! Small Airport Food is a true joy, especially the breakfast! Good to see you back in the row again, Bruddah Lou. Runway is a place I like to hit up when I am dragged from the safety of my bed-cave on the weekends. Quite the place to be when it is storming and you get plenty of cloud-to-ground action while indulging gravy and breakfast taters. Their food is edible but the service is usually as scarce as a stewardess on a 20 minute flight. Watched people come in, eat and leave while still waiting for our food. No drink refills and the waitresses would get within a table or two, then turn and walk the other way. Managers don’t care either which explains why they have a permanent “Under New Management” sign to try drawing you back in. I like cafes and the airport hook might be worth a trip. Just don’t expect anything close to a decent dining experience and you may enjoy it. I can’t speak to your experience, but when I went the place was pretty full yet our waitress continually was coming by to check on us and refill our coffee and water. I thought they did a great job, for the most part. And if they didn’t, you know I’d say something. My kids loved the “chicken landing strips”. We always had good food and service there. Thank you for the reminder about this place! Try Ozzies next. Good food and if the OU students are flying more crash landings than a meth house. Chicken fried steak with No Steak. Has Been Ruby’s waitress. Yeah sure, Ozzie’s that’s the ticket. You go to a place best known for their baked omelettes and you order french toast, sausage, scrambled eggs and biscuit/gravy? SMH, that’s why I give you no credibility. Anyway, they do have good food, agreed, and their wait staff has always been on point the 3 times we’ve been. Glad to see this review. You are back in full swing and fine fine form Louis. 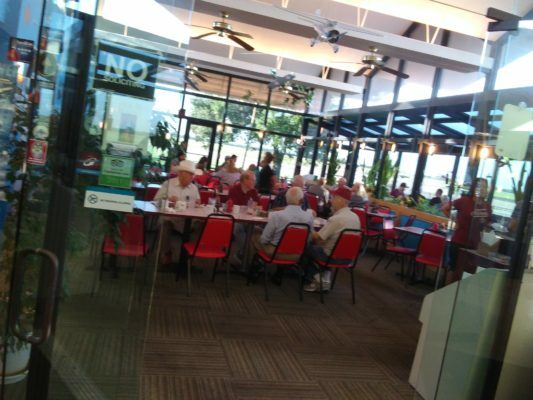 My son loves to eat here with his old frat buddies. Glad you gave them “props” Lol. 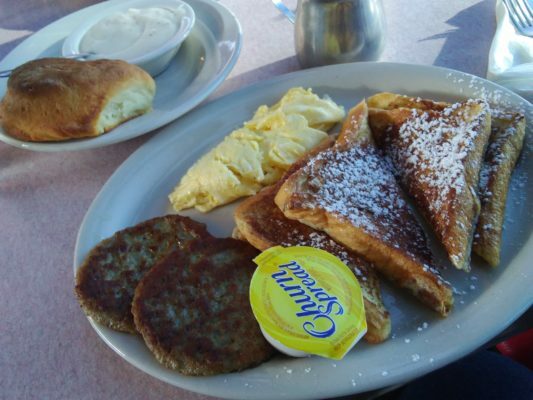 Baked omelets (especially the veggie one), hash browns, toast and service are great. Best of all, Runway Cafe serves breakfast until closing at 2 p.m., for the few afternoon breakfast people in this city. The photo with this review shows a bigger crowd than I’ve ever seen there.